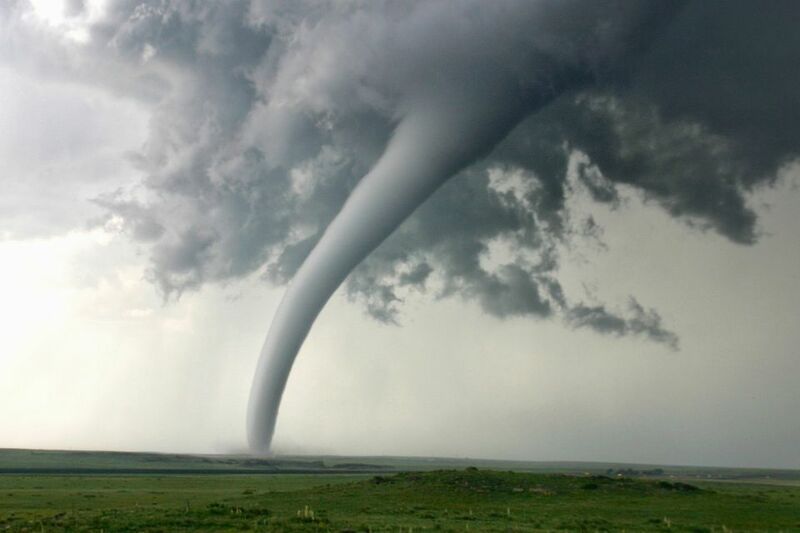 Tornadoes, considered to be nature's most violent storms, are more common in the United States than in any other country in the world, according to the National Oceanic and Atmospheric Organization (NOAA), which operates the National Weather Service. While there has been a tornado recorded for every U.S. state, some parts of the country are more prone than others to tornadoes. If a tornado warning is issued, move to a safe place or shelter, such as a basement or under a sturdy piece of furniture. If you are in your car when a tornado warning is issued, get out of the car immediately and seek shelter. Tornadoes should be taken seriously because they can cause much destruction, even uprooting trees and knocking down buildings. Winds can reach more than 300 miles per hour. Thunderstorms usually start most tornadoes, along with a clash of warm, moist air with cool, dry air. This clash causes an unstable atmosphere and creates a spinning effect of rotating air that rises vertically. When a funnel cloud like this touches down upon the ground, it's categorized as a tornado. East of the Rocky Mountains is where tornadoes most often occur, specifically in a sub-region known as Tornado Alley. Tornado Alley includes the Midwest states of Iowa, Kansas, Missouri, Oklahoma, and Nebraska, as well as the southern state of Texas. Not included within Tornado Alley but also known for strong tornado activity are the Southeastern states of Mississippi, Georgia, and Florida. The map above shows the average annual reports of tornadoes in the United States, with yellow representing 1 to 3 tornadoes reported per year, orange representing 3 to 5 tornadoes reported per year, and red representing 5 to 10 tornadoes reported per year. There has been a tornado recorded for every month of the year, but spring and summer are the seasons when tornadoes happen most often. The National Weather Service defines a tornado watch as meaning: "Tornadoes are possible in your area. Remain alert for approaching storms." The National Weather Service defines a tornado warning as meaning: "A tornado has been sighted or indicated by weather radar. If a tornado warning is issued for your area and the sky becomes threatening, move to your pre-designated place of safety." You can also tune in to the television and radio, as the National Weather Service issues announcements in the event of a tornado watch or warning in the form of a news "crawl" or an Emergency Broadcasting System test. Otherwise, a smartphone app that is capable of issuing push notifications is ideal. The "Tri-State Tornado" killed nearly 700 people and injured more than 2000 more in March of 1925, ripping through Missouri, Illinois, and Indiana. The "Natchez Tornado" traveled along the Mississippi River in both Louisiana and Mississippi in 1840 killing more than 300 people. The "St. Louis Tornado" happened in 1896 and winds may have reached up to 260 miles per hour. More than 250 people were killed 255 people and about 1000 people were hurt.